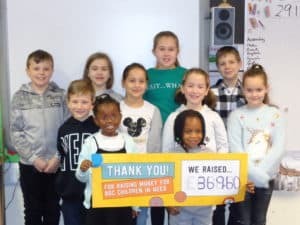 CHILDREN IN NEED 2018 – THANK YOU!! This autumn the school council organised a mufti day and colouring competition to raise funds for the BBC’s Children in Need Charity. We raised a whopping £369.60! Meanwhile, in the staffroom, the staff took part in the very enjoyable ‘Duck Race’ which raised another £40! A huge thank you, to all children and their families who have supported the school council with this fund-raiser.